Learn the physics behind the sport. Properly align your body for the maximum balance while you ski. Exit the ski lift without falling on your face. Break through to the next level of ski performance! Renowned instructor, coach, and ski technique expert Ron LeMaster takes you beyond The Skier's Edge by improving, expanding, and enhancing that seminal work. The result, Ultimate Skiing, will help you master the mechanics of great skiing as never before—explaining how it’s done, showing how it looks, and describing how it feels. Throughout, LeMaster incorporates his one-of-a-kind, full-color photo montages and 3-D diagrams to take you onto the slopes and into the action. These phenomenal images capture some of the world’s greatest skiers while illustrating the correct techniques for every condition and terrain. Ron LeMaster has spent more than 30 years as a ski instructor and race coach. Certified and accredited by the Professional Ski Instructors of America, LeMaster is a technical advisor to the U.S. ski team and Vail Ski School, and he lectures frequently about technique and biomechanics to ski schools and teams around North America, South America, and Europe. A regular contributor to skiing magazines, LeMaster also has written technical guides for the Professional Ski Instructors of America. He holds degrees in mechanical engineering and computer science. LeMaster lives in Boulder, Colorado, where he enjoys skiing and cycling. "Ultimate Skiing explains how to ski smoothly, strongly, and confidently. Through Ron LeMaster's insights from analyzing and coaching the best skiers in the world, you will improve your skills for better days out on the hill." 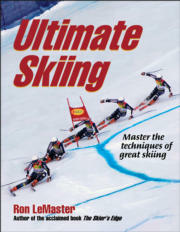 "Ultimate Skiing provides the definitive description of the inner workings of ski technique and performance. Ron LeMaster's expert instruction, complete with tools and drills to assess and adapt ski technique, is your ticket to skiing like the professionals."